Game Of Thones will begin its penultimate season in a little over a month, and is going out in a quite literal blaze of glory. According to Entertainment Weekly, the show set a whole bunch of stuntpeople on fire for a scene in which Daenerys‘ dragons do their business. 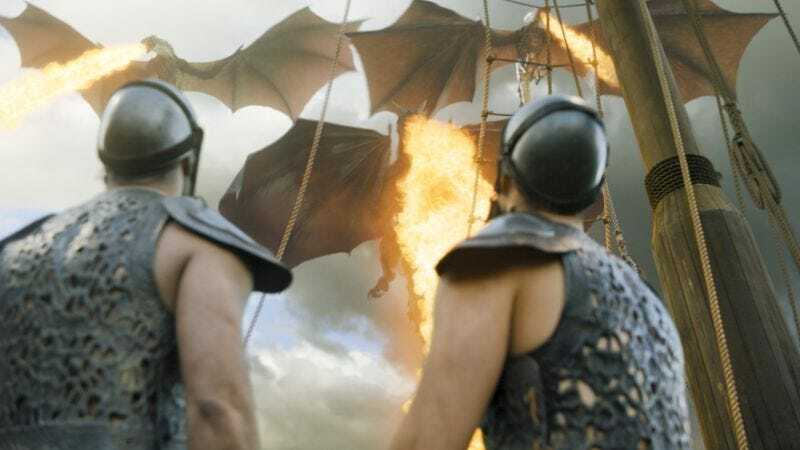 Specifically, the production ignited 20 all at once, which is a new record according to both stunt coordinator Rowley Irlam and showrunner David Benioff. “One sequence has 73 fire burns and that itself is a record,” Irlam told EW. “No film or TV show has ever done that in a whole show, let alone in one sequence. We also set 20 people on fire at one time, which is also a record. I think in Saving Private Ryan they had 13 on a beach, and on Braveheart they had 18 partial burns. Because of the nature of our attacking animals, we had the liberty to expand on that.” Basically: If you have dragons, why not use them? EW’s story goes on to describe how genuinely life threatening this is for the performers involved. If they don’t hold their breath for the entire length of the 30-second process, they could ingest the flames, which could potentially reignite even after they’re extinguished. So next time you’re marveling at Khaleesi’s destruction, think of the stunt labor that went into it.